Cucina Povera: Yes, I do give a Whoop! 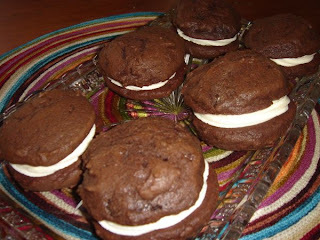 Whoopie pies - Have I been living under a rock? Do I need to get out more? Whilst in the States I watched quite a bit of Food Network. 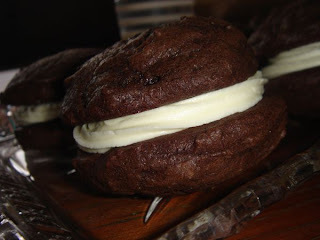 I keep hearing 'Whoopie Pies' and want to know, what are these things that sound like a Bronx cheer? As you would know by now, I am currently having a deep and meaningful love affair with cupcakes. Am I jumping ship by venturing into whoopie pie waters? I need to make these to see what the fuss is about - NOW! These little cakes are surprisingly simple to make. Traditionally they have a marshmallow filling - but of course I had to bastardise it and fill mine with vanilla buttercream - I didn't have marshmallows on hand and thought that the cakes could use the extra creaminess of buttercream as opposed to a gooey spreading of marshmallow, but that is just me, you do as you wish and let your own taste be your guide. Preheat oven to 180C/350F and line 2 baking sheets with parchment paper. Sift dry ingredients together in a bowl and set aside. Beat butter and sugar to a cream, add vanilla and egg and beat to combine. With a wooden spoon, fold in flour and milk, alternating a third at a time until well combined. Drop tablespoons of the mixture onto your baking sheet, making sure you leave a 2 inch gap between each, as they will spread. Bake for between 10-15 minutes, or until springy to the touch. Allow to cool completely on a wire rack and sandwich with vanilla buttercream. With an electric mixer, beat icing sugar and butter until mixture becomes crumbly. Add milk,vanilla and salt and beat until mixture becomes smooth. Carefully spread on one half of your whoopie pie and sandwich with another half. 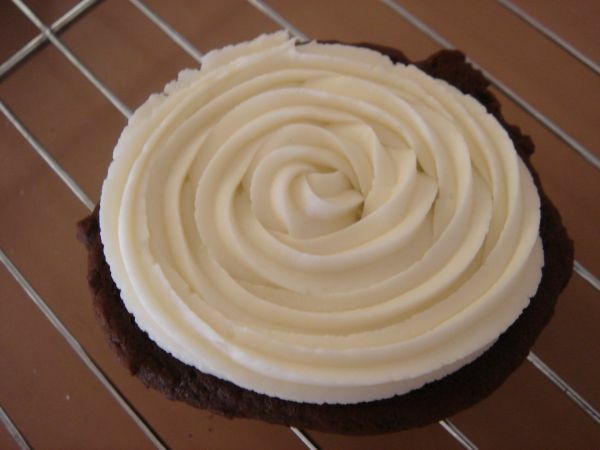 Alternatively you can use a piping bag and pipe your buttercream for a neat result. In a microwave proof bowl, add marshmallows and water. Microwave on high for 20 seconds. Stir until smooth. Spread over half of your whoopie pie and sandwich with another half. 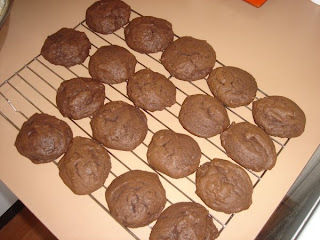 This recipe should give you about 9 decent sized Whoopie Pies. A nice little Amish inspired treat, sure to make you go 'Whoopie!' when you take your first bite.